Capstone Mining’s mill at the Minto copper mine in the Yukon which has been placed on care and maintenance. Source: Capstone Mining Corp.
Capstone Mining Corp. [CS-TSX said Thursday it is terminating a deal to sell its Minto Mine in the Canadian Yukon to Pembridge Resources Plc. [PERE-LON]. Capstone also said it is immediately putting the mine on care and maintenance while it waits for copper and equity markets to improve. Shares of Capstone, which also has operating mines in Arizona and Mexico, fell 7% or $0.05 to 66 cents on Thursday. Headed by CEO Charles Linsley and President Peter Bojtos, Pembridge is a company that was set up to acquire assets that are considered no-core and that are either in production or about to reach that stage. Pembridge agreed to buy the Minto Mine in February 2018 in the hope that it can extend the mine life of the operation by three to four years. Under the terms of the deal, Capstone expected to receive US$37.5 million in cash, as well as shares equal to a 9.9% stake in Pembridge. At the time of the agreement, Capstone had a mine plan that supported operations to 2021 with a total resource base of 23 million tonnes at 1.42% copper, containing 708 million pounds. Expected annual production is currently 33 million pounds of copper. However, on Thursday October 11, Capstone said Pembridge has been unsuccessful in completing the financing required to complete the Minto purchase. So to preserve Minto’s value, Capstone said it is putting Minto on temporary care and maintenance, while continuing to explore value maximizing alternatives, including discussions with Pembridge and other potentially interested parties. The company said operations will cease immediately. Milling operations will also wrap up in the next few weeks once the current stockpile is processed. Capstone has pegged the cost of placing the mine on care and maintenance at approximately US$5 million in each of 2018 and 2019, with the ongoing costs expected to be under US$4 million annually thereafter for environmental compliance and other activities. Approximately 200 employees and contractors will be affected. As Minto has been the Yukon’s only producing hard rock mine in recent years, Thursday’s announcement is a blow to a region, which is known primarily for its placer gold mines. Hopes that the Territory’s roster of hard rock mines will soon increase have been fueled by an ongoing exploration boom and the influx of some of the world’s leading gold miners. Goldcorp Inc. [G-TSX; GG-NYSE], Barrick Gold Corp. [ABX-TSX, NYSE] and even Newmont Mining Corp. [NEM-NYSE] have gained a toe hold in the region, either by optioning projects in the White Gold area, or by taking a direct stake in a handful of the territory’s best known exploration juniors. Meanwhile, Victoria Gold Corp. [VIT-TSXV], Alexco Resources Corp. [AXR-TSX; AXU-NYSE] are gearing up to open new mines next year. Victoria Gold continues to develop what is expected to be the largest hard rock gold mine in the Yukon’s history. 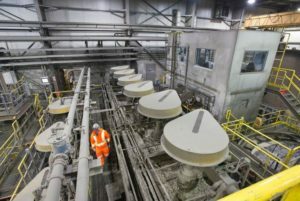 The Eagle Gold Project, located 85 km north of Mayo, is expected to produce 200,000 ounces of gold annually using heap leach processing methods. Full construction commenced on March 15, 2018, with completion and first gold pour scheduled for the second half of 2019. Alexco Resources is getting ready to restart production at the United Keno Hill Mine site, which ranks as Canada’s second largest producer of silver, behind Cobalt, Ontario. During an illustrious history, it produced 217 million ounces of the precious metal. If all goes according to plan, Alexco expects to produce 4.1 million ounces of silver annually in the first three years after re-negotiating a silver streaming agreement with one of its key financial backers, Wheaton Precious Metals Corp. [WPM-TSX, WPM-NYSE]. The deal aims to eliminate some of the downside risk associated with the project.